dying board sort of put a damper on that attempt. So, get out your parser interface and let's see what we can do here. -- Weaver, December 18, 2008, 03:05. The historical moment. I HAVE DUBBED IT RUBYQUEST. IS THIS ACCEPTABLE? -- Anon archiving thread 2, same day, 09:49. Another historical moment. This is by far the most adorable King's Quest style game I've ever seen. -- 'Christmas Ape', near the end of thread 1, just before the real fun starts. RubyQuest is the quest that started it all. Not technically the first quest, but definitely responsible for popularizing the Quest format, generating metric fucktons of fanart, and almost singlehandedly responsible for the existence of TGChan. 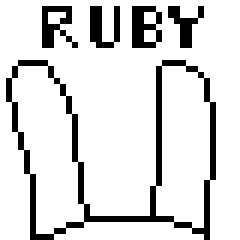 RubyQuest was authored and drawn by Weaver. Ruby has appeared twice Inside the Quest. This page was last edited on 24 August 2016, at 11:14.